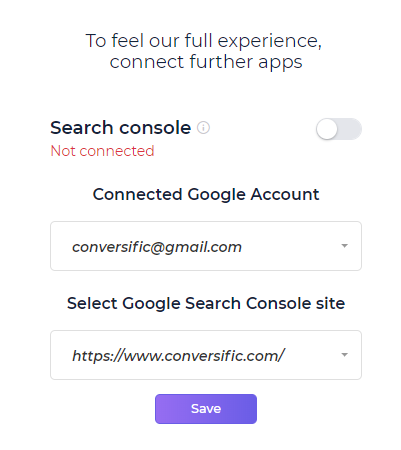 Connecting your Conversific account with Google Search Console is rather simple. You can get it done during the initial registration process or any time later if you go to settings. 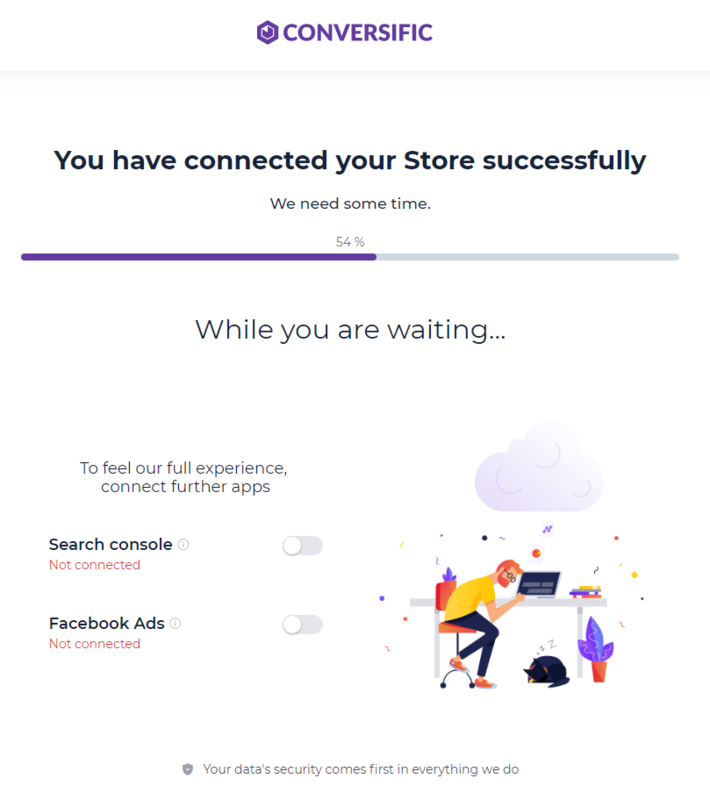 After you have connected your Google Analytics account and your store just click on the slider next to Search Console. First choose the e-mail address representing your Google Account or connect a new one. The next step is to select the appropriate URL for your store with the help of the drop down menu below 'Select Google Search Console site'. If you have no options here it means that there is no Search Console site created yet or it is not connected with the account you have submitted before. Learn how to create a Search Console account here. Once it's done you just need to hit the Save button and that's it. Navigate your cursor to the top right corner of the screen and open the dropdown menu by clicking on the arrow pointing downwards next to your email. Here you can either change or add your Search Control site by clicking on the arrow at the end of the Search Console row. Here choose your Google Account (email address) and Search Console site (URL). Once it's done don't forget to click on the save button. If there are no Google Search Console site options for you to choose from then you've either given a wrong email address or you have no Search Console site associated with the selected Google Account. Here is how you can create a Search Console site if that is what you need. If you did everything correctly the green Connected label is going to reward you. P.S. : Check out our other support articles if you need help with something else or write a message to help@conversific.com. We are more than happy to help you!